I’m a Malaysian Chinese and moved to Perth WA in 1980’s to complete my degree. Being of Asian descent, I’m a crazy foodie. I love every sort of cuisine and enjoy not just eating but cooking. I also love art, music and reading. I currently work part time in the Accounting and Technology industry and am full time mother of two gorgeous girls. My oldest has just moved to Sydney, she’s 26 and my baby is now 14 years old and in high school. I’m sure most of you know what it is like with a 14 year old teenage daughter. Your life tends to evolve around them. I have always been aware of how fragile our planet is and how we are affecting the sustainability of our environment. My oldest daughter studied Marine Biology and is passionate about saving the Ocean and marine life. We know about pollution, recycling plastics etc but being involved with Eco Fashion last year was an eye opener. Never had I realised the impact of fast fashion to our environment. I have learnt so much with regards to Sustainable fashion. The little things we can do to help save our environment. We have always been a household that recycles our household rubbish, minimize on plastics, using our own shopping bags. With regards to fashion, this is new for us, we have started to make better choices in what we wear. We do try and support sustainable fashion. Op shopping is something we are also trying as well. We were told to go for a casting in Fremantle last year, as my youngest decided to try modelling. We met Zuhal and the team, saw how passionate she was in what she was trying to achieve and we were hooked. Their passion to provide sustainable designers especially the start-up designers a chance to showcase their wonderful designs, the opportunity for all models regardless of age and size to walk for the designers. Their passion to get the message out there about sustainable fashion. She has changed the way young girls thing about fashion. How else could you change the mentality that sustainable fashion is not just about drab clothes and hippy wear but it is also haute couture, if you don’t showcase it. As a part of the EFWA 2018 team, what role or roles will you be filling? Last year we started off as Garment managers (I think it was such a lovely title) but we had no idea what we were doing. We just tried our best managing the designers outfits, ironing and steaming and getting girls dressed backstage. 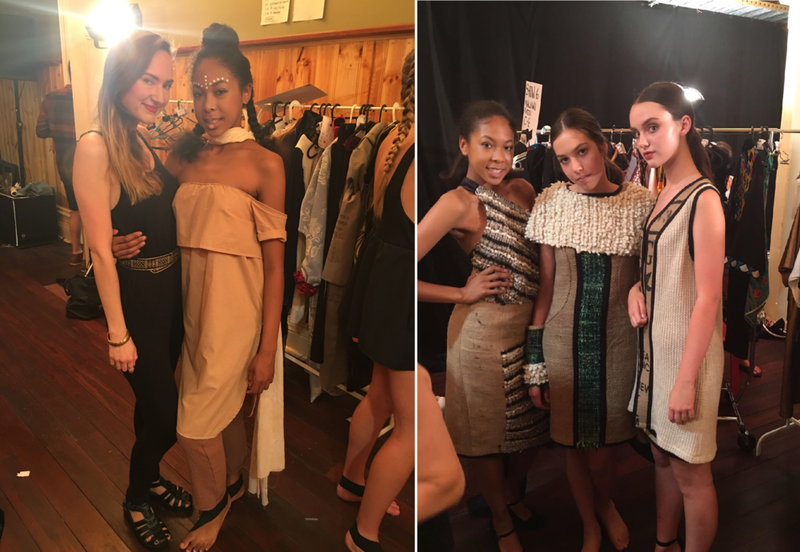 Highlights of being backstage for EFWA 2017 was meeting all the lovely designers and also hosting a designer from Spain, the lovely Sylvia. This year we are helping Zuhal co-ordinate matching the overseas designers with host families during EFWA in November. I have learnt that sustainable fashion does not just impact the environment, but it is also beautiful fashion and works of art.